Be sure to call the Museum at 530-283-6320 to confirm current hours as staff is reduced to one person and may not always be available. 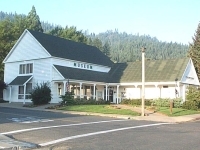 The concept of an active, living museum is evidenced by the dozens of different exhibits, events, meetings, and functions held at the Plumas County Museum. View the latest exhibit additions. The Industrial History Wing features Railroads of Plumas County, Gold Mining on the Feather River, and TIMBER!, an exhibit about the lumber industry of the county. Other developing collections include natural history specimens, audio-visual resources, the Chinese influence, and the historically accurate Andrew Lynch Memorial Garden. The Exhibit Yard provides the visitor with a look at some of the equipment used by Plumas pioneers to wrest a living from the area’s natural resources. A sleigh, water wagon, hydraulic monitors, logging equipment, a working blacksmith shop, and restored gold miner’s log cabin are just some of the items found here. The museum also features the Stella Fay Miller Mezzanine Gallery, which is utilized for contemporary cultural displays by county artisans.